Ready for Your New Teeth? Dr. Walker offers several types of dentures to Chandler, AZ patients looking for a conservative way to replace missing teeth. Our dentist is trained and experienced in modern denture advancements, making them more durable, stable, and natural looking than ever before. Dentures are a tooth replacement solution that revitalizes the appearance of your smile and gives you back the ability to eat, chew, and speak comfortably. Through careful consultation, Dr. Walker will help you decide if dentures are the best solution for you, and if so, which type of denture will meet your needs to the fullest. Which is the perfect option for you? These dentures are designed to replace multiple missing teeth while stabilizing your bite. If you have all teeth missing on the upper or lower arch then these full dentures provide a replacement smile. Dentures that can be removed for cleaning and sleeping are ideal for those using partial or full dentures. Implant-supported dentures are a more stable solution that provides a permanent fix to enhance appearance and added protection to the health of the jawbone. Dr. Walker's office is filled with amazing people that truly care about their patients. I've been going to their office for a few years now and have even taken some long breaks in between, but they still remember me every time and treat me like they saw me last week. If you're looking for a dentist, DEFINITELY give Dr. Walker & team a call! Retained dentures bring stability and long-lasting benefits. In most cases, an implant-supported denture will offer the most benefit to a patient who chooses dentures as an option for tooth replacement. 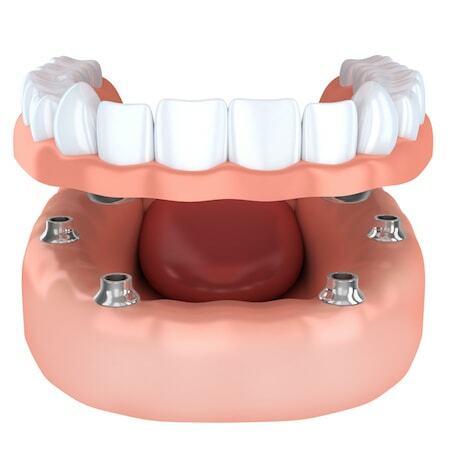 Implant-supported dentures are held in place with the assistance of carefully placed dental implants. Your dentures will snap on to the implant for a stable placement that prevents shifting or movement of the denture. To learn more about the dental implant process and the health benefits they provide, visit the dental implant page here on our website. Any denture by our Chandler, AZ dentist is designed with care for maximum function and appearance. Discuss your tooth replacement options with Dr. Walker, who will help you find the best solution for your personal desires and needs.